There are just 3 days until the Genesee Country Village’s Domestic Skill Symposium. I will be teaching two workshops on Sunday. We will be making a rolled sewing case in the morning and a sewing box in the afternoon. Some of you may know I am an obsessive pre-planner. That being so, I pre-cut the fabric in my mind a half dozen times before actually starting cutting it last night. Yep, that’s me. 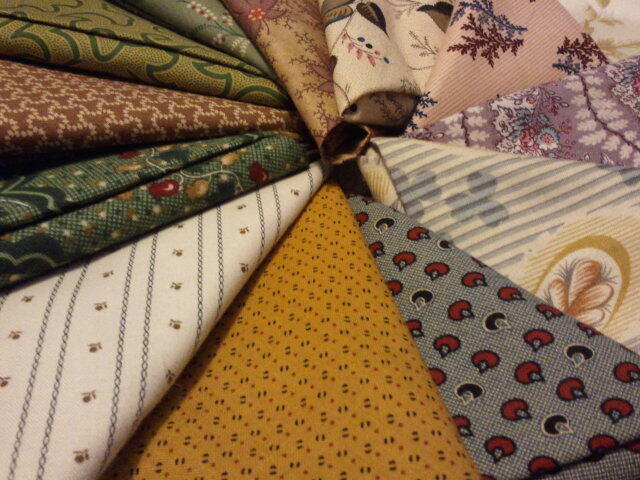 Each one is a reproduction cotton from my favorite fabrics shop: Chestnut Bay. How great is it to have a fabric shop with a reproduction room so close by?!? When I sat down to cut, I opted not to use the larger prints because I thought that would be unfair to participants. Plus, bigger prints are harder to work with if you happen to be one obsessive about centering motives or getting balance or symmetry. I am so excited, not only to hold my workshops but also to see the museum hold this symposium. They have such a great venue for this. Thank you for sharing your excitement with us. The fabrics are so lovely. I sure wish I lived closer. Have a wonderful time. Good luck on your workshops (I so wish I could attend!). Those fabrics are just so perfect, you’re definitely a lucky duck with a whole reproduction fabric room! The one local fabric store that does stock reproduction fabrics has about 2 rows worth and that’s it.